A new Christmas movie has just been adding to Netflix’s growing list of holiday films. 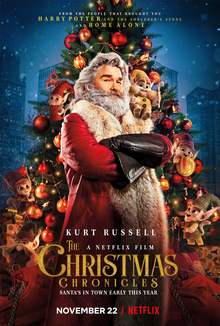 “The Christmas Chronicles” stars Judah Lewis, Darby Camp and award-winning actor Kurt Russell as Santa Claus. The movie has some other big names too, including Kimberly Williams-Paisley and Oliver Hudson. “The Christmas Chronicles” is a new take on Christmas. The film is about two kids (played by Judah Lewis and Darby Camp) who are trying to move on from a recent family tragedy. The kids try to catch Santa on video during Christmas, but this plan quickly spirals out of control and the children end up adventuring with jolly Saint Nick himself. The movie has many surprising twists and turns, including some musical numbers to go along with it. IMBD rates this movie a 7.4 out of 10 stars. Rotten Tomatoes gives it 66 percent, and Common Sense Media gave it 3 out of 5 stars. Many of the reviews rave about Russell as Santa. “The Kurt Russell–as-Santa Claus movie you didn’t know you needed,” Flick Filosopher’s Maryann Johanson said. To sum it up simply, most of the reviewers love Russell as Santa, but they aren’t sold on the rest of the movie. The Christmas Chronicles is available to stream on Netflix now.